Caenlochan Glen is located east of Glas Maol behind the Glenshee ski area and offers some easily accessible ski touring and steep skiing. It features a South facing “sunny side”, and a North facing “dark side”, givng numerous aspects and terrain options. There are three ways to get to Glas Maol from the A93 which then allow you drop into Caenlochan. The easiest option is to get a lift pass and use the Glenshee lifts - a short skin off the top of the Glas Maol lift will get you to the top of Glas Maol. There is currently (2017) a "tourers pass" available that allows single use of 3 lifts to get to the plateau. Alternatively, you can park just before the Glenshee car park (close to the telephone mast) and use the summer path to Glas Maol - this means touring very close to the Glenshee lifts and approach Glas Maol via Meall Odhar and the obvious ridge climbers right of the Maol bowl (~1 hour). 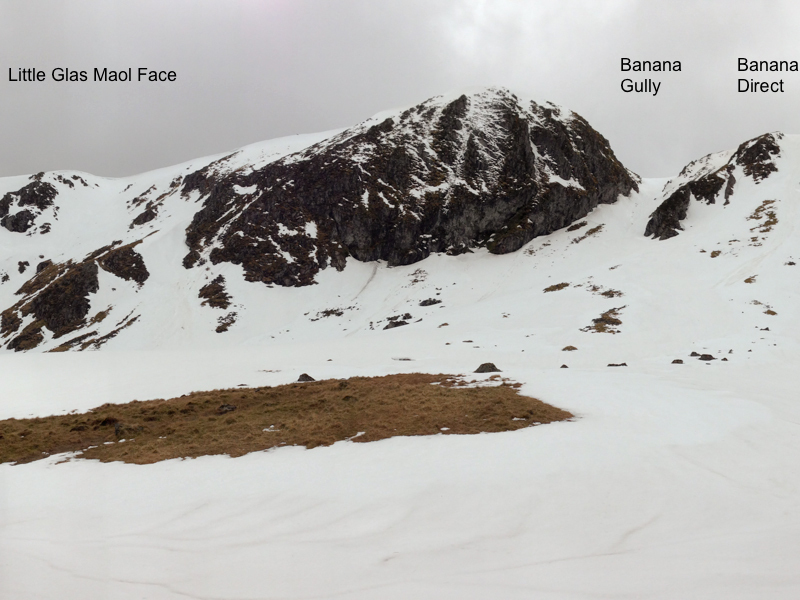 The best option, provided there is good snow cover is to park close to the Devil’s Elbow (parking marked on map). Cross the little stream and follow it past the Leecann Dubh ridge. Swing left into the valley and approach Glas Maol via one of the faint ridges to arrive at the Glas Maol plateau close to the Cairn (marked on OS map) (~1 hour 15min). In good snow conditions this offers a absolutely fantastic descent all the way back to the car park. An alternative approach is to park at the end of the road in Glen Isla, and follow the track, and then path round into Caenlochan, or follow the south ridge of Monega Hill to gain the plateau. A mountain bike would be useful for the landrover track. 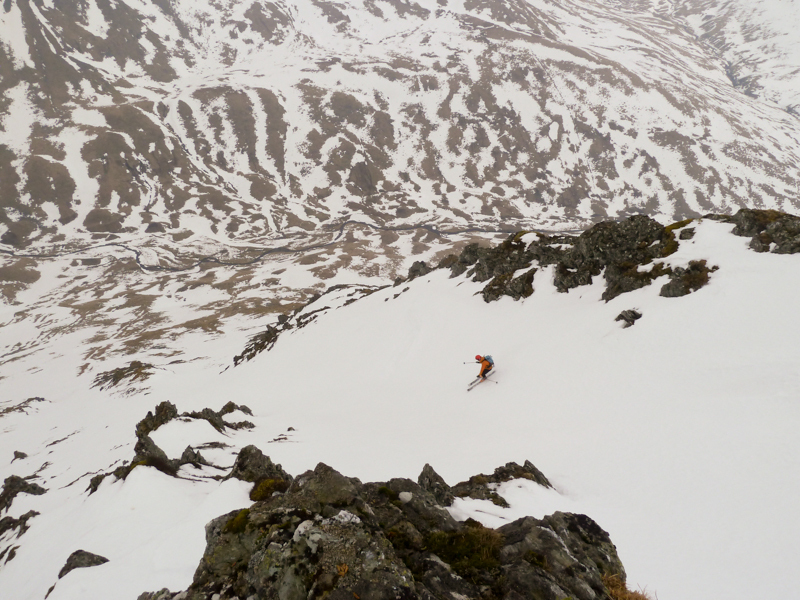 The North facing “Dark Side” offers numerous nice descents between 30-40 degrees and a great introduction to steep skiing in an easily accessible glen that still has a real “remote” feel to it. Banana Gully offers a great introduction to skiing in the area. The face beneath Little Glas Maol offers numerous nice ridges and faint gullies and descending off Monega Hill at the end of the plateau offers a really nice line in a great setting. You might see tracks of a snowmobile as a herd of deer are kept in this and neighbouring glens. The quickest way out of Caenlochan Glen is via Banana Gully. In good snow conditions and good weather, the skiing on the South facing “Sunny Side” is fantastic. 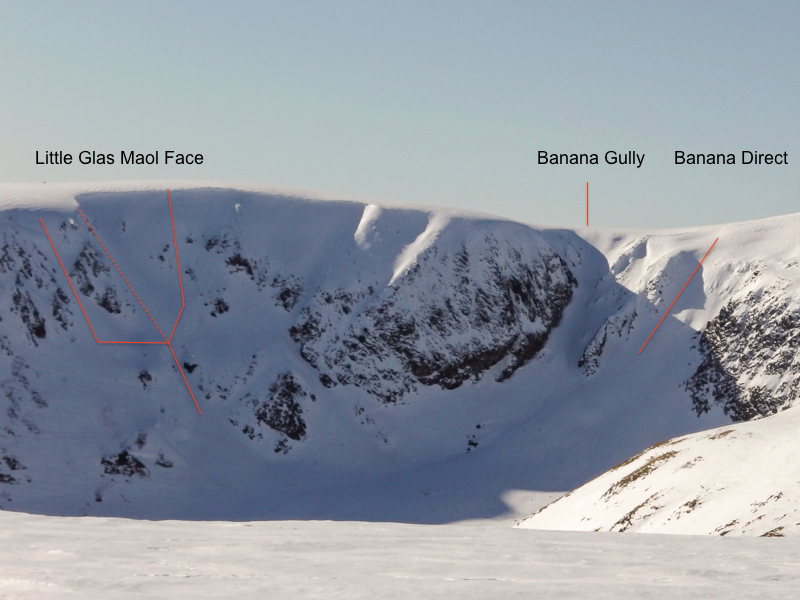 Either approach through Banana Gully having had a good view of the conditions from the plateau or ski from Glas Maol towards Cairn of Claise and then swing right and skin towards Druim Mòr. 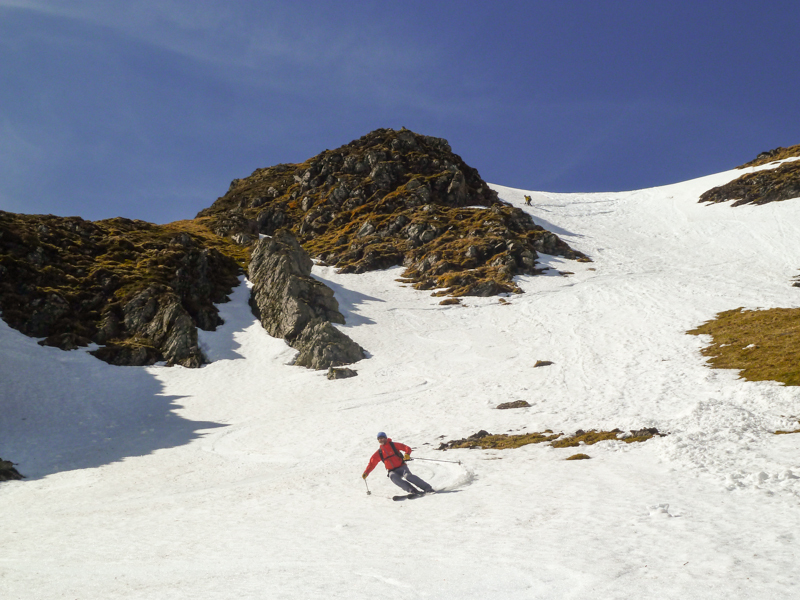 The bowl below Druim Mòr offers a great descent (keeping skiers left at the bottom for an exit which can be tricky). Sunny side offers many different shorter descents especially towards the bowl of the summer path to Caderg. An excellent little film by Philip Ebert shows many of the descents, and is referred to in some of the related descriptions below. 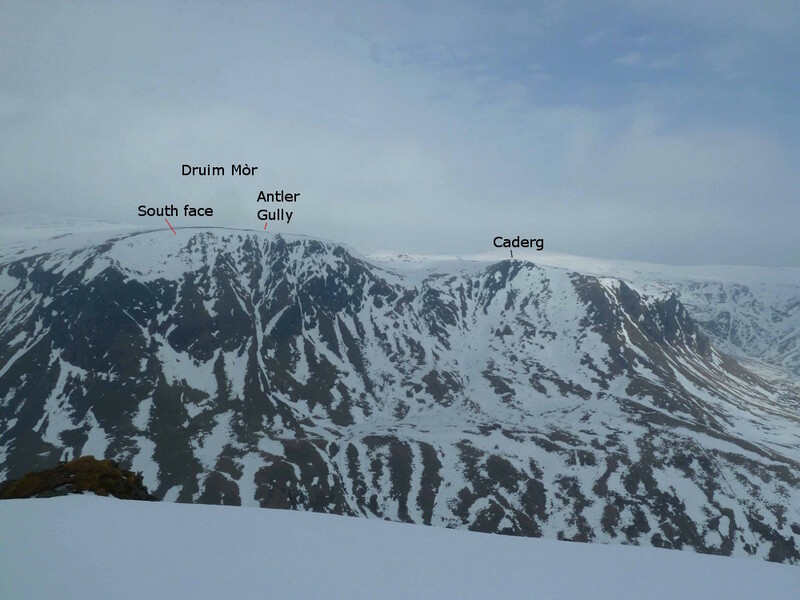 There is one relevant Scottish Avalanche Information Service forecast for Glas Maol: Caenlochan. Two nice parallel gullies right at the end of the plateau off Monega Hill offer a beautiful run. (up to 35 degrees, maybe steeper at the top). These gullies are easily approachable from the Little Glas Maol plateau and the entry is easily found (the last two gullies on your left before the end of the plateau). Returning via the valley floor towards Glas Maol offers a nice skin back with a good view of the lines off Little Glas Maol and on “Sunny side”. 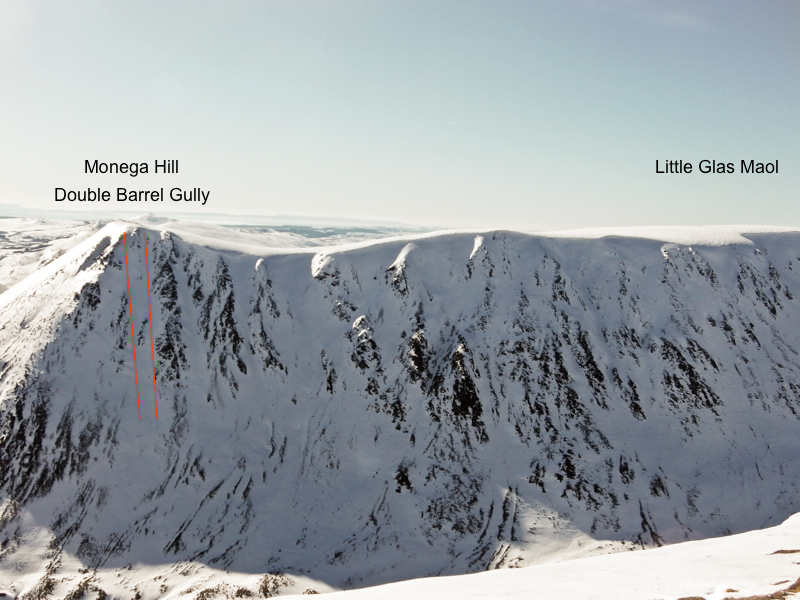 There are numerous possible descents from Little Glas Maol into the Caenlochan Glen. Approaching them from the floor of the glen having descended either Banana Gully or Banana Direct is recommended. The entries from the top are not obvious and cornices can be very big. When touring on the plateau make sure to stay well clear of the edge. The corrie has not only large cornices but also numerous small inlets, that are not well marked on the map which can be dangerous in flat light. Two nice descents are marked on the photo and a dotted line is definitely possible. Many other descents are possible. 200m before dropping down towards the col and entry to Banana Gully, turn left into a steepish slope (watch if it is loaded). It is separated from Banana Gully by a rocky ridge. The skiing is up to 40 degrees. Banana Gully is a well known, and popular descent. From the top of Glas Maol ski in south easterly direction ski to a small col a little over half way towards Little Glas Maol. Descend the big obvious curved gully. Druim Mòr is the southern outlier of Carn of Claise, and is a prominent headland above Caenlochan Glen. Start about 100m West of the top of Druim Mòr. The South face is initially an open bowl offering a nice descent into a smaller gully (towards skiers left). If the entry below the top is difficult, the bowl can be skied further skiers right. There are plenty of options for variations on this face. 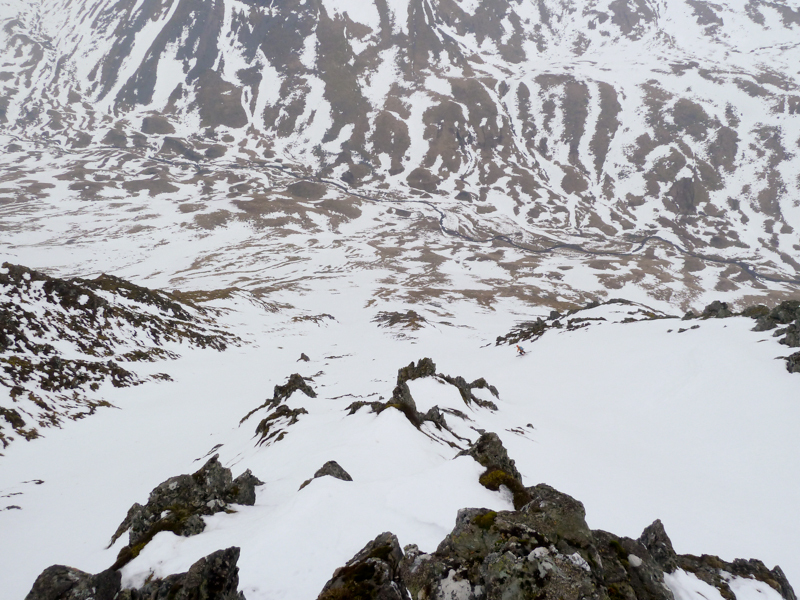 The most prominent gully in the centre of the south face of Druim Mor approximating the stream line on the OS map. Start down a moderately steep entrance, possibly corniced or enter via a rib from skiers right. Descend with a steep wall on the left until after about 50m a rock island is reached. The main line continues on the left side (steep,narrow) though it is possible to descend on its right side at this point entering the right branch of the upper gully. Below the rock island trend slightly right looking for the narrow exit below onto the lower slopes. 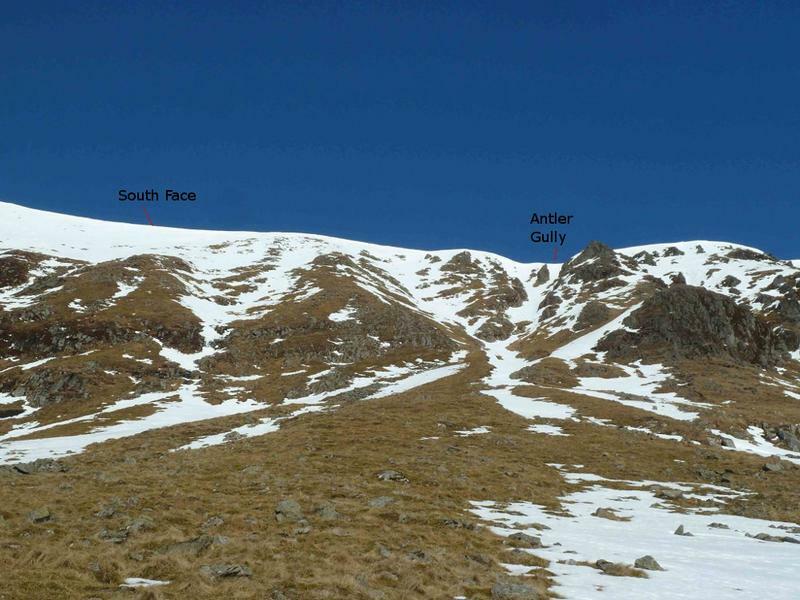 With good snow cover it is possible to descend to the floor of the glen giving 400-450m descent. It is probably best approached from below to ensure the exit is complete and also to choose your line in the upper section. The gully has two main branches either side of the rock island. Could be difficult to locate correct line from above. From the valley floor numerous well-defined small gullies between Druim Mòr and Caderg offer some very varied and fun skiing.